POR15 or Rust Encapsulator or Rustoleum or Rust Bullet and on the list goes. There are the big guns and there are the rest, the big guns being POR15 or Rust Bullet. So much has been written about these and so many forums trashing each other it’s difficult to know where to start. Why did I pick POR15? Well the reviews were between the big guns and I had seen a few independent tests where they painted and froze the parts defrosted and froze again etc in salty water, the results from those tests the POR came out best. I have rust on my car I want it stopped and I want the least amount of hassle I can. I know the only true way is to cut out the metal and replace. But those smaller areas and treatable areas can be saved with this stuff? What does POR stand for? Paint Over Rust! I started with the “starter pack from “Frost” restorations to see what it was like. 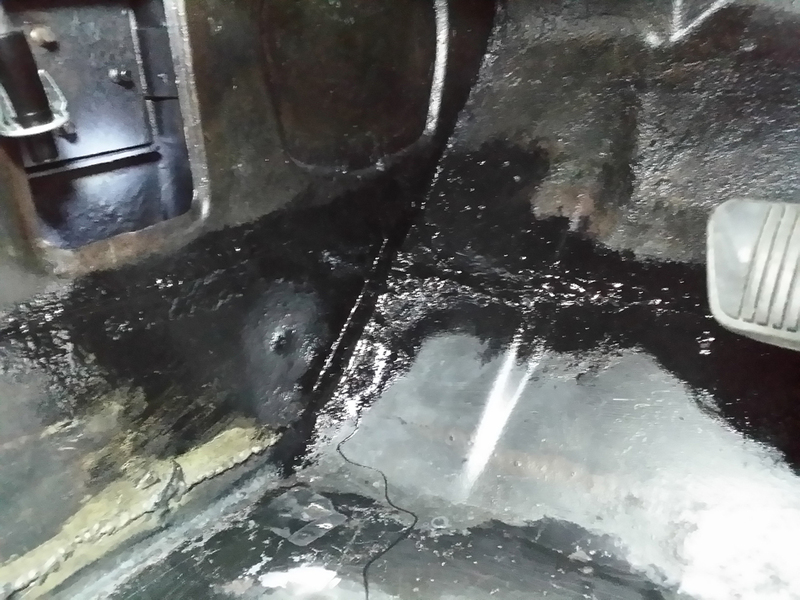 The trunk area had rust all over the place where the tank was supposed to go. So I thought I would give this stuff a go. At the time I had the car this was the first job that I did and well before the idea of the blog was thought up. As a result the only pictures I have are the finished article or the boot loaded up with the parts as she arrived. As there was only a small amount to do the starter pack would be ideal to see what it was like. 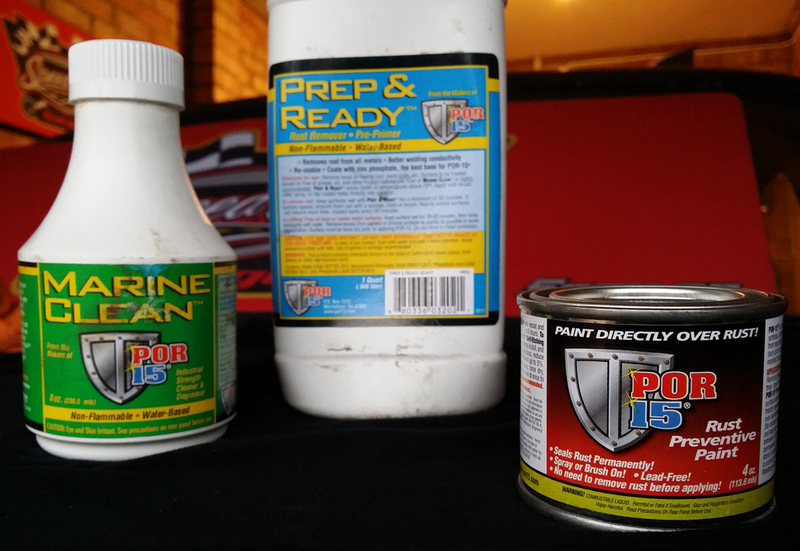 Inside the box there is the Marine clean, Prep & Ready, and small tin of the rust preventative paint. there is a brush (which is pretty rubbish) and a foam style applicator. The gloves are for a small pair of hands and tore when I tried to put them on. You will need gloves, if you don’t then you will have stained hands for days or weeks until it all wares off, you can’t wash it off. This is the annoying bit, the steps process to get this stuff on. Firstly you need the area clean, then the marine clean to degrease, then the prep & ready, wash off, let it dry completely, then paint, then paint again, then possible paint again. It’s a total process and has to be followed correctly or you will get people moaning that the paint has flaked off. There are guides for the humidity to apply the paint, the time it takes to dry etc. The paint is quite runny and does not need to be tinned out in my opinion, if you are going to spray then they recommend the max of 5% thinners. First the clean down and remove the loose flaking rust. Do NOT remove it all as the rust will activate the paint. This paint does not really like new smooth clean paintwork and works best on the surface rust to bind to it. This is a write up of the general process as it’s all the same no matter what part you are using. 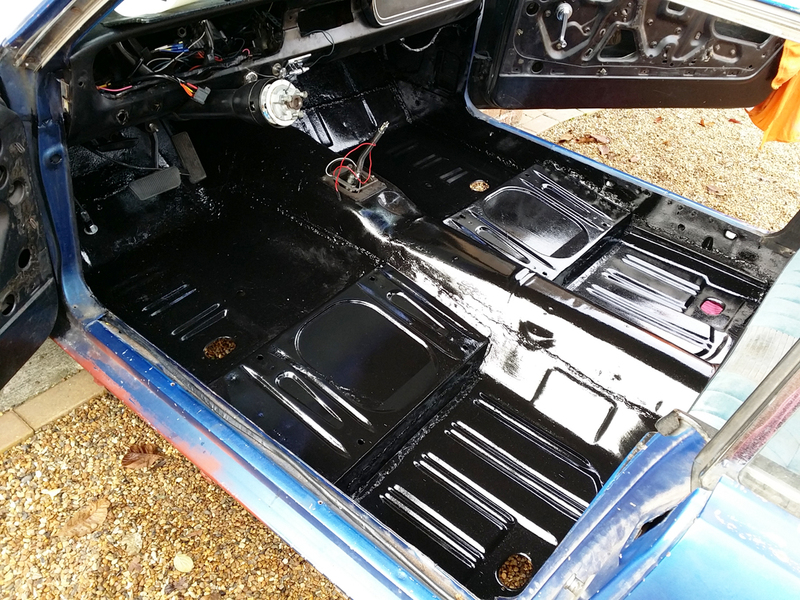 I will post the process of the floor pan treatment but the process for all my POR work is exactly the same principle, the other works can be seen under the photo menu – Bodywork – “Fender work” and others that I have posted on this blog. A list of all the quick links is at the bottom where I have used POR15. The application of the “Marine Clean” is the degreaser and remove all the sticky bits and anything than will stop the paint from binding. this is the elbow grease time and will make the difference to the application of the paint. a possible couple of applications to make it clean might be required, or you could use any quality cleaning agent to do the job. I use their clean as it was formulated with the whole process in mind. Apply the Prep & Ready. (It used to be called “Metal Ready”). The application of this can be brush, spray dip or what ever you want, but the important thing here is the metal must remain wet for at least thirty minutes up to an hour depending on the weather. The prep fluid has a very slight tinge of blue to it when fresh. Frequent spraying is required and you need to keep an eye on it. For smaller parts these can be dipped into a container to be completely treated. I used this technique when cleaning some brake spring parts etc. The liquid can be re-used when in the container with a lid, so I try to treat the metal where I can, the left over liquid once it has had time to cure I pour into the containers for smaller parts. Keep checking for bubbles on the metal, if you see any brush them away or sponge them smooth. The Prep & Ready will (should) leave a zinc coating on the metal and etch the surface ready for the receiving of the rust prevention paint on fresh metal. Once the Prep & ready has been removed you must thoroughly rinse away with water, sponge, cloth rinse what ever you need to remove the Prep & Ready. The next most important part is the drying. The area must be “bone dry” as the POR people say. I did read somewhere that a single drop of sweat into the tin will be enough to activate the paint! I wish I had kept that piece of literature I have not been able to find it since, that was from the POR guys too. The recommended process is to decant into a tub or small container and then use the brush from there rather than going directly into the tin. This will save waste and save ruining the rest of the liquid in the tin. The mixing method is to stir the paint and not shake it. Tip: If you are going to close the tin for a while then the paint will seal the tin closed and you will not be able to get the lid of again. To prevent this use cling film (the recommended way) or a thin plastic sheet (my preference) over the top then push the lid shut. The paint itself is not thick and will brush on evenly and on some surfaces will dry without the brush marks. If you apply to much in a single go the paint will nor spread evenly and can leave small areas not protected. This will happen in some places and I suspect that is why they recommend “at least two to three applications” of the paint to make sure all exposed areas are fully covered. I found that while using the paint over large areas the paint will start to go off (drying) on the brush and can drag the paint around and not apply it evenly. The way round that is to get another brush. You can clean the brushes with the POR solvent, but my preferred method is to buy some brushes then bin them after use. This stuff dries rock hard once it goes off. the bristles on brushes are no exception. The application of the second coat should be when the paint is almost dry “two to six hours” where there is a slight finger drag on the paint. If the paint cures then the light rubbing down of the first coat is required with three hundred grit sand paper to enable a key for the next paint layer. When the paint is first applied it does not look very black almost a very dark grey, but the second coat will make sure the colour goes black. You can see from the centre picture here that the paint was little patchy, but it will be fine after the next coat. The paint is not very UV friendly and this question and answers section is from their web page; “If the surface is exposed to the sun for an extended amount of time, the UV rays will eventually break down the POR-15 and cause it to fail. That’s why we recommend you topcoat it.” Under the fenders or in the trunk is the ideal places out of the light. But if you leave it to the sun there is a clear warning here. Oh so difficult. The inside of the trunk has been treated and the paint still looks like it did two years ago. The car stood outside in the snow for two winters and there is no change. How long will it last for I have no idea, but the forums say it still looks like new after five years or more etc. I have not seen any rust appear on the parts I have painted. I did a comparison test of Rust Cure vs Rust Buster on a piece of metal that was rusting. This can be found under the Reviews section of this blog or the quick links below. what I also did was quickly paint a single coat to the metal of POR as well just because I could. I didn’t pre treat it, was it nothing, just finished the brush on the metal. That has stood up to the test of time and weather and shows no issues nearly a year later. Time is only way to tell if this stuff works. where I have the car apart or important places I will use this paint. The car will not be run in the rain (if I can help it), it will be garaged, it will be lovingly waxed and polished. I hope that there rust exposure will be limited. I have not had any cracking, I have not had any peel off, so the product does indeed seem to be doing what it claims to do. The fact I am trying to take a photo of the black paint on a curved surface is difficult at the best of times. But I think you get the idea anyway. I did rub down the paint with a bit of force and none of this gently touch it lark. the sandpaper was almost unmarked from being used on both sides of the pan. The second coat when on a lot easier but did peel of in a tiny section that I missed where the wax treatment was previously near the welds. the rest was stuck fast. Front and middle sections completed with two coats. These estimates are for a single coat although two or three coats are recommended. Pint = 50 sq. ft.
Quart = 96 sq. ft.
Hi-Temperature Paints (Factory Manifold Grey, Black Velvet, POR-20): For exhaust components 8oz. will coat an average set of manifolds and a small set of headers. I reckon I used one full tin to do both footwells with 2 coats. Even more difficult I think to give a accurate score. I have to mark this down just because of the performance you have to go through to apply it, as it’s not a quick process by any means. The POR (Paint Over Rust) is not entirely correct as you have to remove loose rust, clean, prep, paint, re-paint, top coat etc. It’s a lot of steps, but if it works I will go through that pain to get the results. It’s also quite expensive as well, the paint, prep and cleaner all come to a hefty investment. That’s without the brushes you throw away as well. I like love the idea of the Eastwoods Rust Encapsulator (£20 an aerosol tin) where you just spray and go. But that is definitely not the case here and I knew that when I bought the kit in the first place. The other new products on the market from POR15 are now in an aerosol spray self etching primer etc. that I have also just ordered out of interest, will this be the ideal scenario? Anyway, I have used it as it’s supposed to be good, from what I have seen – it is. Will I use it again? Yes, and I have ordered a few tins and the latest being the “six pack” in order to save on the wastage and only use what I need too. POR15 sections from their web pages that may be of use. APPLYING POR-15 TO SEASONED OR RUSTED METAL: First, wire brush loose rust and scale. Then remove any grease or oil with POR-15 MARINE=CLEAN and prep with POR-15 METAL-READY. DO NOT USE SOLVENT- BASED CLEANERS.PRIMING OVER POR-15: Use POR-15 Tie-Coat Primer after POR-15 is dry, following directions on can. Tie-Coat Primer may be sprayed or brushed in multiple coats if desired. Sands to a perfect finish.CHROME MOULDING CLIPS can scratch a new paint job when they are pushed through the body. POR-15, even if scratched off, will only rust where it’s removed, so rust won’t travel upward to ruin that new paint job. Coat around holes and under chrome before you prime and paint.ROOF DRIP RAILS are a place where rust begins early. Put on a coat of POR-15 and let dry. Then apply a second coat, wait for it to dry, then apply a coat of POR-15Tie-Coat Primer and topcoat as desired.STAINLESS STEEL TRIM PIECES that push down around the windshield… if they won’t stay down, put some POR-15 in the channel and brace it with wood strips overnight. Regarding windshields, with the rubber removed, put a coat of POR-15 around the body where the rubber rests; this is a high humidity area and should be sealed with POR-15. POR-15 INSIDE REAR EXHAUSTS will stop rust where it starts.LOWER COWL SECTIONS, ROCKER PANELS, LOWER PORTION OF FENDERS AND REAR QUARTERS, INSIDE DOORS are other good places to coat with POR-15.RUSTED OUT PINHOLES: Put a piece of tape behind the larger pinholes, then paint. When the paint dries, pull the tape off and paint the back side as well. 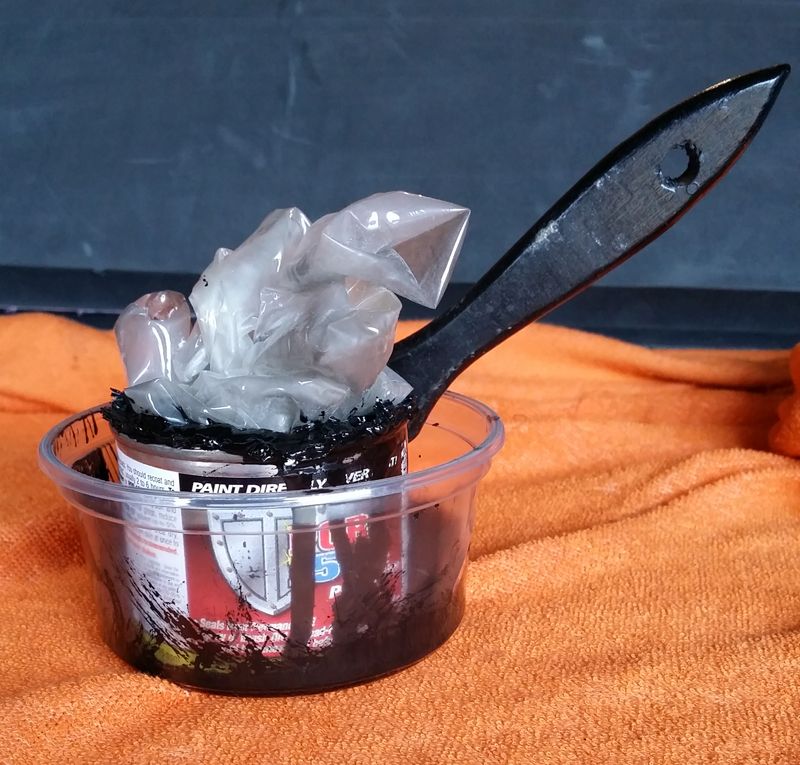 POR-15 can be used to seal gas tanks, also, and POR-15 PUTTY will take care of larger holes.OLD CARDBOARD INTERIOR PIECES AND MOLDED VINYL VISORS can be coated with POR-15 and then painted over with vinyl dye.Reminder: POR-15 SHOULD BE STIRRED, not shaken, each time you use it. MANY PRODUCTS CLAIM TO STOP RUST; SOME ARE PAINTS, SOME ARE CONVERSION PRODUCTS, SOME ARE RUST TREATMENTS. NONE SEEM TO REALLY STOP RUST PERMANENTLY. WHY IS POR-15 DIFFERENT, AND WHY SHOULD I BELIEVE IT WILL WORK ANY BETTER? Rust is caused by moisture coming in contact with metal, which causes a chemical action called oxidation. All paints provide a measure of protection for a while, but since they are eventually softened and weakened by moisture, it is only a matter of time before moisture penetrates the painted surface and attacks the metal below. All of the so-called rust preventive paints on the market (except POR-15) are weakened by exposure to moisture. POR-15 is strengthened by exposure to moisture. Notice the hardness of the POR-15 coating. It doesn’t chip, crack, or peel like ordinary paints do, and its hardness will resist the wear and tear of every day life. Rust conversion products claim to change the chemical nature of rust and convert it to a more stable element that won’t rust again. History of the failure of these products is well documented; most simply don’t work for more than a few months at best, and they are subject to the same chipping and cracking that occurs with ordinary rust coatings. POR-15 works because it chemically bonds to rusted metal and forms a rock- hard, non-porous coating that won’t crack, chip, or peel. It keeps moisture away from metal with a coating that is strengthened by continued exposure to moisture. IS IT BETTER TO BRUSH OR SPRAY POR-15? Most people brush it on, but many spray also. Proper equipment and organic vapor particulate respirators for solvents are essential for spraying. HOW DO I THIN POR-15 IF I WANT TO SPRAY IT? You should use only POR-15 Solvent for thinning. Keep lacquer thinner handy for clean-up. Do not thin POR-15 more than 5%. CAN I PAINT OVER POR-15 WITH OTHER PAINTS? Absolutely. POR-15 will accept all paints, including lacquer-based paints. POR-15 Tie-Coat Primer is the best prime coat to use before topcoating POR-15. Be sure to read thoroughly our directions and tip sheets regarding topcoating before using POR-15. CAN I USE BODY FILLER OR PUTTY WITH POR-15? Yes. First paint both sides of the rusted area with POR-15; then use body filler or putty as soon as the POR-15 is dry to the touch. HOW LONG DOES IT TAKE POR-15 TO DRY? That depends on the ambient humidity (surrounding area). The more humid the area, the faster the dry time, which usually varies from 3 to 6 hours. IS IT DANGEROUS TO GET POR-15 ON MY HANDS? No, but if you do, remove it at once with solvent or lacquer thinner. If POR-15 dries on your skin, nothing will take it off, and you will ‘wear’ it for 3 or 4 days until natural oils and flaking skin remove it. ARE THE POR-15 VAPORS DANGEROUS TO MY HEALTH? Yes. That’s why you must always paint in a well-ventilated area and keep your nose away from the paint container. POR-15 is not dangerous if you follow our simple directions. WHAT IS THE BEST SURFACE ON WHICH TO PAINT POR-15? POR-15 likes rusted surfaces best. Seasoned metal and sandblasted metal are also good. POR-15 does not adhere well to smooth, shiny surfaces, but will adhere well to those surfaces with the proper preparation. WHAT IS THE ‘PROPER PREPARATION’? We make a product called ‘Metal-Ready’. It’s a rust remover that leaves a zinc phosphate coating on base metal, the perfect preprimer for POR-15. NOTE: New steel is coated with a protective oil finish at the mill. This finish must be removed before using POR-15 or Metal-Ready. Clean metal first with POR-15 Marine-Clean, then rinse with water and dry. WHICH POR-15 (BLACK, SILVER, GRAY, CLEAR) SHOULD I USE? Silver contains metal filler and should be used in badly rusted, pitted areas. It will fill in holes better than black or clear. Black is generally used on frames, underside of fenders, etc. because that’s the usual color there. Clear renders the smoothest finish and is often used as a preprimer on exterior surfaces; Gray is great on concrete floors, bilges, storage areas, as well as steel. MUST I PAINT OVER POR-15 TO MAKE IT LAST? No, but POR-15 has an ultra-violet sensitivity and must be topcoated if continually exposed to sunlight. Once topcoated, POR-15 will remain effective for many years. WILL THE SUN DESTROY MY POR-15 COATING IF I DON’T TOPCOAT IT? If the surface is exposed to the sun for an extended amount of time, the UV rays will eventually break down the POR-15 and cause it to fail. That?s why we recommend you topcoat it. CAN I APPLY POR-15 OVER OTHER PAINTS? Yes, but you will lose the important benefits of POR-15. You must remember that ordinary paints are weakened by exposure to moisture. POR-15 can’t stop rust if it isn’t in direct contact with the base metal. CAN POR-15 BE USED WITH FIBERGLASS? Absolutely. POR-15 is fully compatible with fiberglass and can be used to repair cracks in gelcoat. It will adhere better than polyester resin and has greater strength. Use also with fiberglass cloth to make super-strong surfaces in rusted-out areas. But be aware that POR-15 doesn’t contain styrene and thus cannot melt fiberglass cloth like polyester resin does. Raw Sewage Test A metal box that houses a filter for raw sewage in a treatment facility was coated with POR-Patch. After a year of service no viable undercutting or rusting was present on the housing. Temperature Resistance POR-Patch is temperature resistant up to 450 degrees. A test showed that no adhesion was lost at 450 degrees F for 10 hours. Lab Test Lab tests show that POR-Patch has excellent adhesion when applied up to 14 hrs of the first coat. Excellent adhesion was proven after application two weeks after the original coat and the intercoat adhesion was determined by a crosshatch tape test. 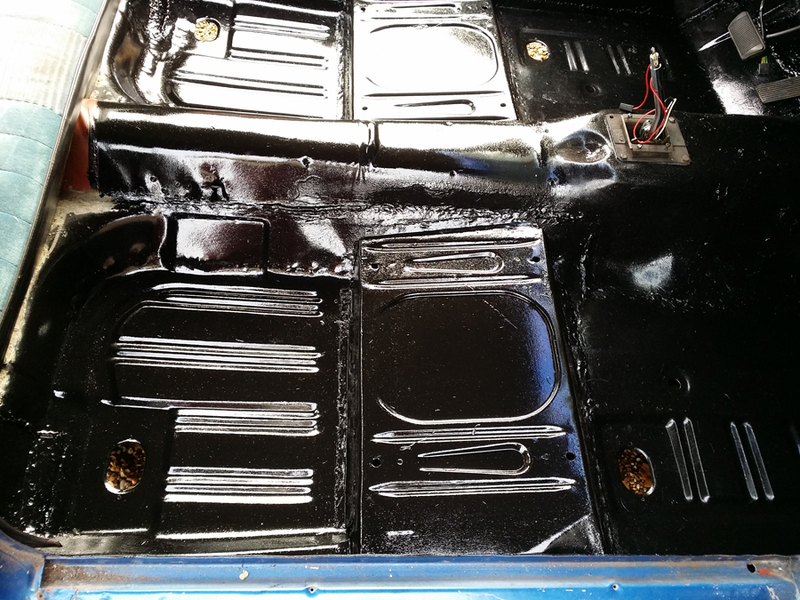 POR-15 Inc. brings the powerful technology of polymeric isocyanate derivatives to the consumer rust prevention market for the first time, a technology vastly superior to competing products currently on the market. POR-15® is easier and less expensive to apply than epoxies, since it doesn’t require mixing: and POR-15® dries to a high-gloss or semi-gloss finish just like paint, except that it cannot be scratched or peeled off. Since POR-15® chemically bonds to metal, the underlying surface does not have to be sanded before application. As long as loose or flaking rust are removed from the surface, an application of POR-15® will not only cover up the rust and prevent it from spreading, but will also strengthen the underlying metal and seal holes by forming its own membranes. POR-15 is a rust-preventive paint designed for application directly on rusted or seasoned metal surfaces. It dries to a rock-hard, non-porous finish that won’t chip, crack, or peel, and it prevents rust from re-occurring by protecting metal from further exposure to moisture. POR-15 is sensitive to UV light (sun) and must be topcoated before prolonged exposure to sunlight. POR-15 is cured and strengthened by exposure to moisture and will dry faster under extreme humidity, but moderate to dry atmospheric conditions are most desirable when applying this product,because extreme humidity may cause an immediate surface cure, trapping carbon dioxide gas below the surface. When this happens, bubbling may occur. Extreme humidity at the time of application may also interfere with proper adhesion of the POR-15 coating to metal because it’s almost impossible to keep metal dry under such conditions. POR-15® is a paint-like substance which acts as a total rust inhibitor and also very effective as a metal filler. Its consistency is approximately that of paint and it has very good spreadability (one quart covers 96 square feet). POR-15® chemically bonds to rusted steel to form a rock-hard, nonporous coating that won’t crack, chip, or peel. It works by isolating metal from moisture; without moisture present, steel can’t rust. Thin, covering coats are best. Apply second coat when first coat is dry to touch with slight “finger-drag” remaining. Solids – 74% Vapor Pressure – 38mm Hg: Boiling Point – 232°F Specific Gravity 1.05 Percent volatile by Volume 25% Weight per quart – 2.25lbs. Solubility in water – insoluble.Appearance: Glossy or Semi-gloss (black only) finish. Application: Brush, roller, spray Spreadability: 96 sq. ft. per Quart, 384 so. ft. per gallon. Recommended Temperature Application: 45°F – 95°E Drying Time: Varies according to humidity; average is 4.5 hours. Shelf Life: Unopened can – 2 years or more. Opened can – up to 6 months. Abrasion Resistance: Using Taber Abrasion Test, POR-15® passes 200 cycles with a 100 gram weight on a CF17 Wheel. Solubility: POR-15 is readily soluble in esters. ketones, and aromatic solvents. Surface preparation: Rusted surfaces are best; seasoned metal and sandblasted surfaces are also good. To coat smooth metal surfaces: Use POR-15 METAL-READY to prepare surface before painting. Surface must be dry and free of grease, oil, or other foreign substances. Use of ‘rust converter’ products is not recommended as they may affect bonding of POR-15 to metal. POR-15 likes to adhere to surfaces with ‘tooth’ rather than smooth, glossy surfaces. STIR CONTENTS GENTLY AND THOROUGHLY before painting. Do not shake. Refrigerate unused portion of POR-15 for longer shelf life. Apply in thin coats, 1 to 2 mil thickness. Minimum 2 coats. Topcoat when first coat is dry but with slight finger-drag remaining, usually 4-5 hours. SPRAY APPLICATION: Use 30-35 lbs pressure for normal gloss. Reduce pressure for lower gloss (20-25 lbs). Thin only with POR-15 Solvent, if necessary, but do not thin more than 5%. TO TOPCOAT A FULLY CURED POR-15 SURFACE: Wet sand with 600 grit until gloss is dull, then paint, or use POR-15 Tie-Coat Primer directly on the cured POR-15 surface, then topcoat as desired.NOTE: Never topcoat a POR-15 surface that hasn’t dried, as this will ruin the coat already down. Use POR-15 Solvent or lacquer thinner for cleanup, which must be done before POR-15 dries. NOTE: Organic vapor particulate respirators, NIOSH/MSHA approved, must be used when spraying POR-15. Moisture will shorten the life of unused POR-15. See our ‘Residual Moisture – Little known Facts‘ page to learn some little-known facts about residual moisture. Seal can or jar immediately after using. We recommend placing plastic wrap between lid can and storing in a cool dark place. For proper adhesion to aluminum, galvanized metal, and smooth steel surfaces, prep with POR-15® METAL-READYT Rust Remover/PrePrimer. Keep surface wet for 15 minutes, then rinse off with water and dry thoroughly. This process will leave a zinc phosphate coating on the metal and insure perfect adhesion. Use on lawnmower housing to prevent rust; keep grass from sticking and clumping in wet weather. POR-15® SILVER contains metal filler and should be used on badly rusted steel to fill small holes and pitted areas. POR-15® BLACK is used on frames, floorboards. under fenders, engine compartments. trunk areas, etc. POR-15® CLEAR dries to a perfect satin gloss, used on exterior surfaces before painting. Excellent for “touch-up”. POR-15® GRAY is ideal for use on concrete. Better chemical resistance, better adhesion to metals, greater ease of application, strengthened by exposure to moisture. Reasonable pot life, non-shattering, great flexibility. No catalyst required for curing. POR-15® is sensitive to UV light (sun) and must be topcoated for prolonged exposure to sunlight. Failure to do this may result in long-term damage to the POR-15® coating. Topcoating is not required for areas not exposed to sunlight. POR-15® was tested for 168 hours at 97°F in a condensing humidity salt spray (ASTM B117). At the end of the test period, coated steel was free of rust or pitting. Acid and alkali resistance tests performed found panels coated with POR-15® to be impervious to gasoline, oil, chromic acid, hydrochloric acid, phosphoric acid, sodium hydroxide, caustic soda, 50% sulfuric acid, and 50% hydrofluoric acid. POR-15® was applied over a rusty substrate as a finish coat (approximately 23 mils dry film thickness). The coating showed essentially no undercutting at the scribed area after 2000 hours in a weatherometer*. A 2 mil thickness of POR-15® was applied to lightly rusted steel and then exposed for 1000 hours to a salt spray. At the end of the test period, no undercutting was observed at the scribed area. Recoatability is excellent. Laboratory tests have shown very good adhesion when applied up to 14 days after application of the first coat. In an actual Field test, a topcoat was applied 6 weeks after the first coat had been applied, and the intercoat adhesion was excellent as determined by a crosshatch tape test. A metal box used as a filter for raw sewage was coated with POR-15® and placed in service within a few hours after the interior and exterior were coated. No visible rusting occurred at the welded areas after a six month exposure. A POR-15® coating was subjected to 450°F for 10 hours; it remained hard and showed no apparent loss of adhesion. A panel subjected to elongation was pulled beyond the yield point of the base metal without affecting the POR-15® coating.